JWEL: The New Royal Range of Ice Cream. Also known as The Ice Cream Empire, a creation by F&N Creameries, this range of royal ice cream is definitely a must-try. I'm a big fan of ice creams and i'm in love with this one. It's affordably priced and it comes in a wide range of flavours that you can choose from. This is the ice cream that made my mom so happy during Mother's Day! I've enjoyed its goodness and now it's time for me to share it with you. 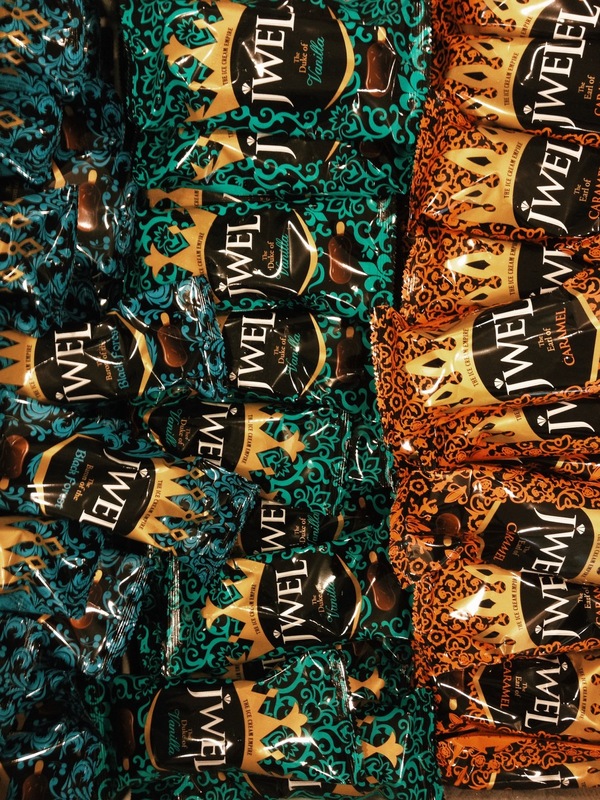 The JWEL ice cream comes in 5 different flavours, and each one is filled with its own unique taste and goodness. Behold, the royal flavours! Don't you just love the names? I personally think it's very creative. Apart from the brilliant names, the best part about these flavours is that they are not too sweet. That's usually the reason why people refrain from indulging themselves in ice creams, but it's an exception when it comes to the JWEL range. It's not too sweet, so to all of you who have a sweet tooth, this one's for you! Eat happily and worry free. Here's my personal favourite flavour: The Duchess of Double Chocolate! The Duchess of Double Chocolate. I love the chocolate almond topping on all the flavours. It gives an extra crisp to the ice cream and adds chewability to the entire ice cream eating experience. Nyumms. Mom's #fingersinframe with JWEL. Look at it glow! From any of these supermarket/hypermarkets: AEON (Jusco), Cold Storage, Jaya Grocer, Giant and *Tesco. Look out for these cute royal packages when you do your grocery shopping! Check out the links below for more updates on JWEL's latest happenings and promotions. Follow JWEL on Instagram | Like JWEL on Facebook | Check out the website. This Mother's Day was extra sweet (literally) because we got treated by JWEL with some pretty legit ice cream. Brought mom to one of JWEL's campaigns at the Empire Shopping Gallery on Saturday, and i'm really glad we were able to spend some mother-daughter time amid our (yes, "our" because when you have 7 daughters, Mother's Day can be pretty packed) busy schedules. JWEL, 'The New Royal Range of Ice Cream Sticks' is a newly launched ice cream by F&N Creameries. They were generously giving out complementary samples at the booth, but unlike the typical take-eat-and-go response to complementary stuff, people actually turned back to purchase a stick or two for themselves and their kids. It's only priced at RM3 per stick at the campaign (!) when the usual retail price is at RM3.50 per stick. This royal range comes in 5 different flavours: Vanilla, Tiramisu, Double Chocolate, Caramel and Black Forest. My personal favourite was the Double Chocolate flavour because unlike other chocolate flavoured ice creams, this one isn't too sweet but just sweet enough to make a chocolate lover like me happy and fulfilled. Just imagine a big wide smile from me right now. Ooohyeah. And in conjunction with Mother's Day, the JWEL team was giving out complementary roses to all the mothers in the mall. Needless to say, that simple gesture widened many mothers' smile - especially mine. That smile widened when we were given a box of JWEL ice cream, complete with all 5 different flavours. Major cheat day alert! The JWEL campaign will be happening at these following locations throughout the month. Be sure to drop by and get a taste of the newly launched royal range ice creams! I'm pretty sure it'll be a hit in no time. *locations are subject to change. Get the latest campaign updates and from the JWEL Facebook page | Website | Instagram. I'm happy when she is. Happy Mother's Day, mom. Everything else i wanted to say to you is in the card, but to sum it up in 4 words: You are the bestestest!